This is one of those combo posts...journaling a memory and writing a little bit about food. 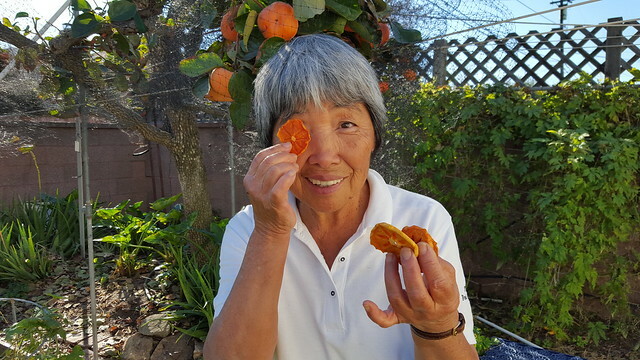 I wanted to wish my mom a Happy 73rd Birthday and show you her dried persimmons ("kaki" in Japanese). My parents have a tree in their backyard that is probably 40 years old. 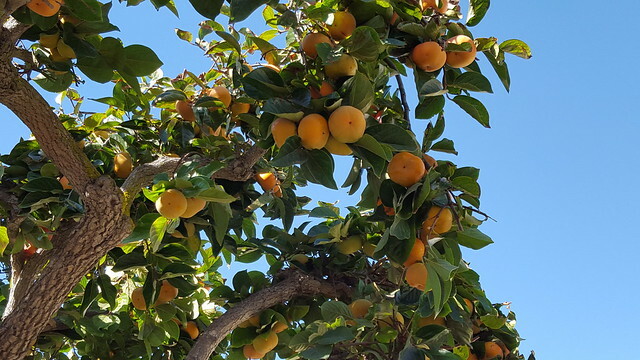 My paternal grandmother gave each son a persimmon tree back in the day and my parent's is still going strong. By the way, these are some of my favorite pictures of my mom and I think it really captures her spirit. She's always in a happy mood. When she retired a few years ago from 30+ years as a teacher's aide and "the cafeteria money taker lady", the teachers invited our family to attend her surprise retirement assembly. The kids treated her like a rock star - she was giving high-fives on her walk up to accept hundreds of homemade cards from all the kids in the school. 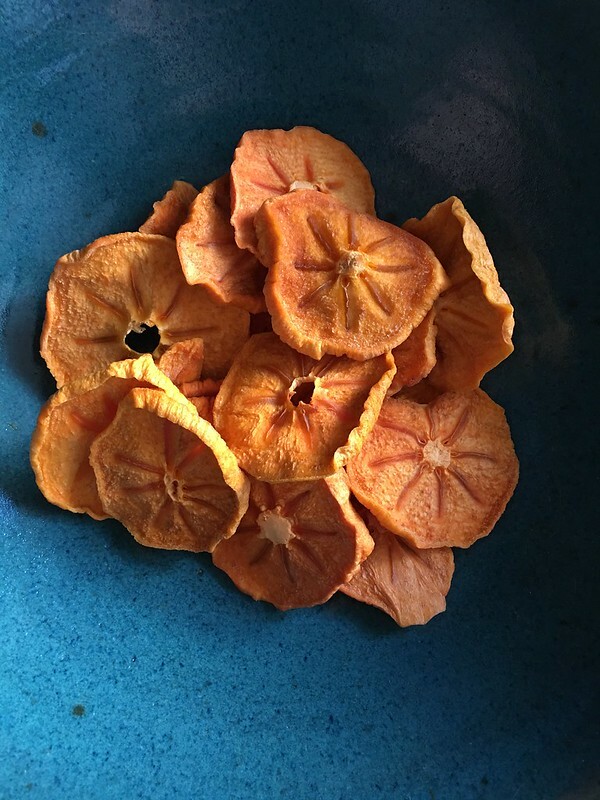 These dried persimmons are totally crack. 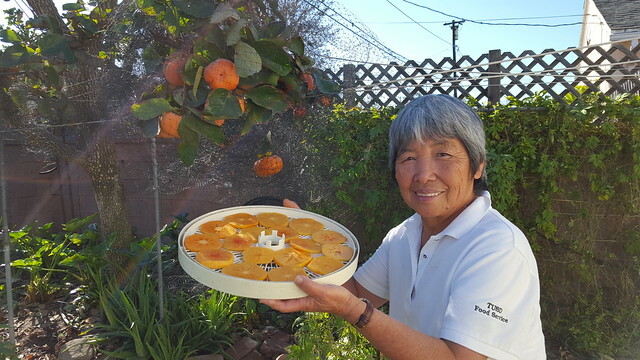 Persimmons are already a very sweet fruit. And when you dry them? Glory be. 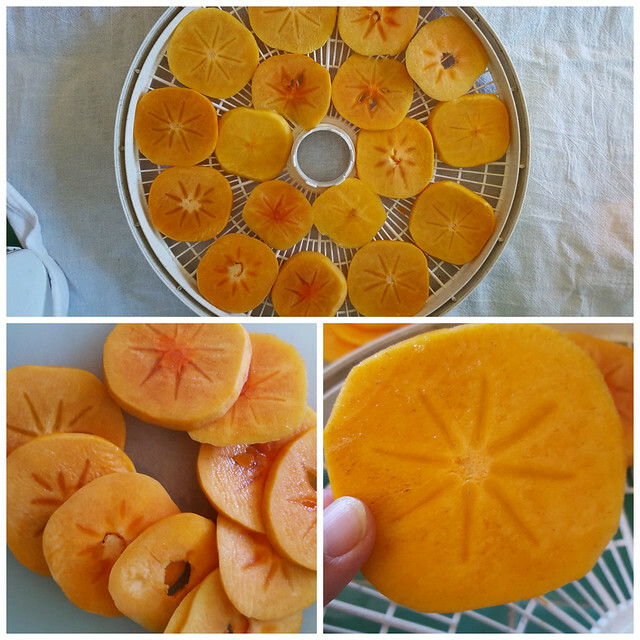 The intense sweetness of the dried persimmon is incredible. In the fall, my mom makes tons of batches...she figures she dried at least 300 persimmons this season! I mail them to friends on the east coast, gift them to local friends, and eat soooo many myself. Cousin Stan and husband David (together I've named them Stavid) tried them for the first time this year and, it's true, just once and you're hooked. 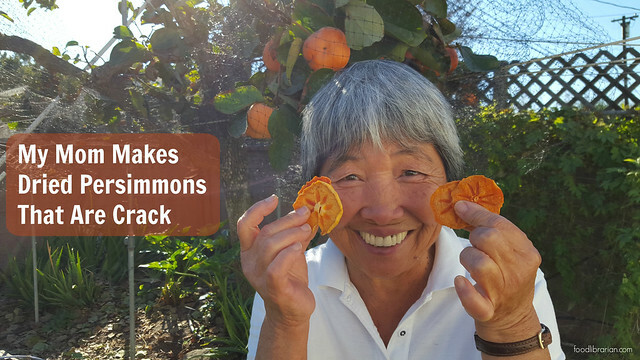 They say, "We're lucky if any of the dried persimmons make it home. We gobble them up in the car and wind up with an empty or near-empty zip lock bag." Last fall, the crop was very good. And, OMG, we finally learned about and bought a fruit picker. CHANGED OUR LIVES. No more ladders! The first time we used it, both my mom and I yelled, "Why haven't we had this for the last 40 years?" If you have a fruit tree, you have to get one of these. It's awesomesauce. The persimmons need to be FUYU persimmons, not the Hachiya persimmons (Hachiyas need to be totally soft before eating them, while the Fuyu can be eaten hard or soft). The fuyu rules! 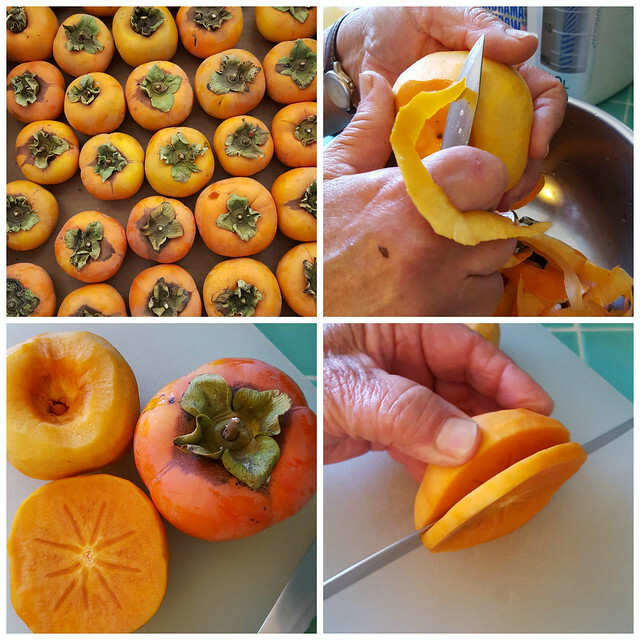 First, peel fuyu persimmons. Mom's pretty quick at this...lots of practice over the years! Second, slice the persimmons the same thickness. That way, they'll dry at about the same time. 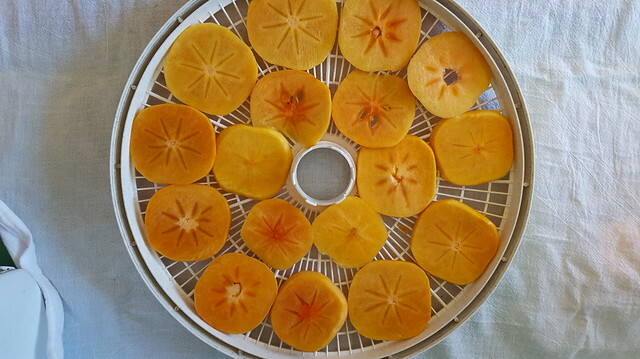 Mom has them sit in the dehydrator for 8-10 hours...depending on thickness and ripeness. Mom usually has them go overnight and turns off the machine in the morning. She has a Nesco American Harvest dehydrator. All the persimmons are gone and most of the dried persimmons have been eaten... I'm looking forward to next year! I love this post...your mom is so happy! What a great idea! And happy birthday to mom! Happy Birthday to your mom! Confession: I've never tried persimmon! What a great tribute to your mom! She seems like a neat lady. Happy birthday to your mom -- she's so cute! I can see why she was so popular at her school, she looks like a delightful person.